Abstract: Enter the socket AM3, AMD Athlon II X2 250 microprocessor - a new 3.0GHz mainstream dual-core chip based on the Phenom 'Deneb' architecture, but crucially stripped of all L3 cache. Now fast forward ten years and the only similarity between the original Athlon and the Athlon II processor launched at Computex 2009 Taipei, is in the name. 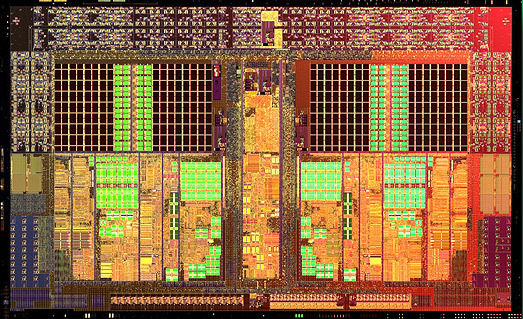 Enter the socket AM3, AMD Athlon II X2 250 microprocessor - a new 3.0GHz mainstream dual-core chip based on the Phenom 'Deneb' architecture, but crucially stripped of all L3 cache. In this course of this review PCSTATS will run AMD's Athlon II X2 250 through a full compliment of CPU benchmarks and face it off against several Intel Core 2 Duo CPUs, the Core i7 920 and dual/triple/quad-core AMD Phenom II processors. If you want to find out just how much processing power is available in an inexpensive dual-core Athlon II CPU, you've come to the right place! Like all the chips emerging from AMD's stables this year, the Athlon II X2 250 is manufactured on the 45nm SOI process at Global Foundries Fab-1 in Germany. The chip has a modest 65W TDP, and looking over specs we find a transistor count of 234 Million, 256KB of L1 and 2MB of L2 cache. Of course, the Athlon II has no L3 cache. It's socket AM3 format ensures backwards compatibility with AM2+ motherboards, and support for DDR2-800 or DDR3-1066 system memory as required. Best of all, the Athlon II X2 250 retails for just $87! Given AMD's popular 690G/780G/790G integrated motherboards with HD friendly HDMI outputs, I wouldn't be unexpected to find the Athlon II rapidly find its place in Home Theatre PCs. Now before we go any further, can the AMD Athlon II X2 250 processor be used to upgrade an older PC system currently powered by a socket AM2 Athlon 64 X2 or Sempron CPU? Likely no. AMD's Athlon II family is built for Socket AM3 and Socket AM2+ motherboards. While the Athlon II has dual memory controllers, so it can work with DDR2 and DDR3 system memory, the majority of socket AM2 motherboards don't offer 45nm CPU compatibility. Check the board manual and manufacturer's website for a BIOS update to be sure. Getting back to the Athlon II... AMD's Athlon II X2 250 is compliant with Hypertransport 3.0, operating at 2.0GHz: data is sent twice per clock cycle (DDR) so the final duplexed speed of HT3 is 4.0GHz. This is sent along a 16-bit/16-bit link, which translates to 16GB/s of bus bandwidth between the CPU and the chipset. With the impending launch of Microsoft Windows 7 operating system, AMD has gone to great lengths to ensure its new Athlon II X2 250 processors and the rest of the Phenom II CPU line have full support for Windows 7. Especially Win7's new 'XP virtualization' feature. The Athlon II X2 250 processor supports full hardware virtualization, allowing a single core to run a copy of Windows XP inside of Windows 7. Neat, yes. Practical when it comes to legacy software that won't run in Windows 7. The Athlon II is also the first CPU to move C1E low power states out of the BIOS and onto the CPU. As the AMD Athlon II X2 250 is priced at a mere $96 CDN ($87 USD, £55 GBP) and is compatible with the majority of AMD motherboards on the market, chances are you'll be seeing a lot of it. A cheap 3.0GHz dual-core processor is ideal for OEM system builders and mainstream computers. If its predecessors have been any example, it'll likely be an excellent overclocker too. But don't worry, I'm not going to leave you hanging. :-) PCSTATS will show you the real performance of the AMD Athlon II X2 250 processor, add in overclocking results and explain how it all fits together. Inside the AMD Athlon II processor is an architecture largely based on AMD's Phenom II 'Deneb', but optimized for dual-core processing. Instead of a large 6MB L3 cache that's shared between four cores, AMD has stripped out the L3 altogether and implemented a more sensible 2MB of L2 cache. Like the Phenom II, the L2 cache is split into a single megabyte of per core. Sticking to a smaller cache size reduces overall cache latency, while increasing the size of a cache means greater hit rates, which reduce the amount of trips needed to fetch information from system memory. Having a large cache makes sense for quad-core processors, but for a dual-core processor like the Athlon II it would most likely be under utilized. Large caches also makes the CPU's silicon die larger, which increases the amount of power consumed and heat produced. AMD has kept the size of the Athlon II processor small, about 117.5mm2. This is in part due to smaller cache sizes, but also thanks to moving to a 45nm manufacturing process. 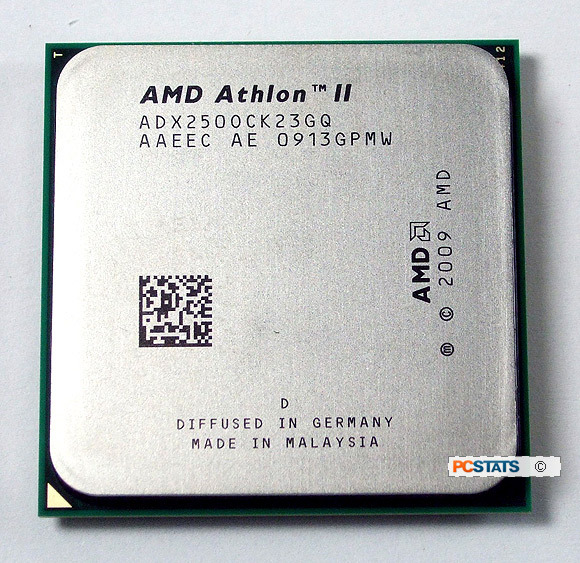 This makes the Athlon II X2 250 one of the smallest processors AMD has ever produced. This also means the Athlon II X2 250 costs a lot less for AMD to produce, and AMD's pricing strategy passes on the majority of those savings on to the consumer. The majority of AMD's processors fall into the $50-100 price range, and the new Athlon II X2 250 is right at the top of that list, which will in turn drop AMD's overall CPU prices even further. The power meter is hooked up and ready to measure, so let's take a look at how much juice a PC system built with AMD's 45nm AMD Athlon II X2 250 CPU actually draws.